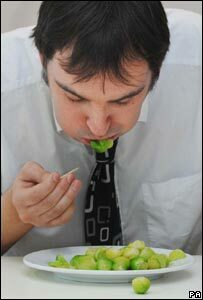 A Devon man who hoped to set a world record by eating the most Brussel sprouts in a minute has failed. Richard Townsend, 24, of Exeter, fell seven short of the target of 43, which was set in December 2003. Mr Townsend, who had eaten a plate of sprouts every day for the last six months, said he just "lost it". After cramming the sprouts into his mouth with a toothpick, he said: "I do not think I could face another sprout for a few days." But then, after he popped one of the remaining vegetables into his mouth, he said: "It's a shame to waste them." The accounts administrator explained his failure, saying a couple of the vegetables "slid off the plate" meaning he could not eat them quickly enough. He had peeled then cooked the sprouts for four minutes in order to ensure they were exactly one inch in diameter. But the record set by Dave Mynard, from London, still stands. Mr Townsend's record bid raised £250 in sponsorship for the Mencap charity, which will be matched by his employer EDF. Mr Townsend decided to try and break the record as part of his mission to replace his New Year resolutions with five challenges which have to be completed before the end of the year. He has so far achieved three of them as he has appeared on TV, met someone who has starred in a computer game and has started a celebrity-signed collection of teabags. His final challenge is to fly in a helicopter before the end of the year.